I did some video of my solar projects with Werner Grundl of VideoSphere and http://energyvision.blogspot.com. He's is adding to his video blog (vlog) all the time, most recently with some important statements from the NE Sustainable Energy Association's "Building Energy" conference. 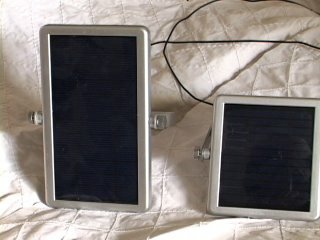 This video is about my solar reading lights which I wrote about in My Solar Bedroom in December, 2005. 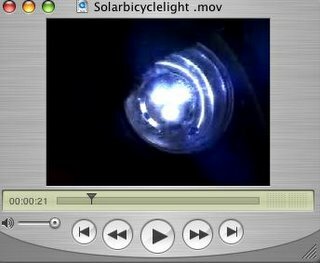 This video is about my solar bike lights and back pack. 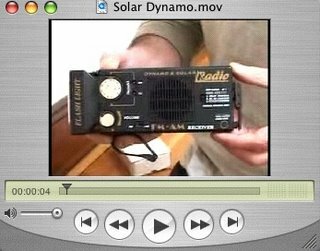 Click on picture This is a video of a solar/dynamo flashlight/radio modified to charge AA batteries thus becoming the flashlight, radio, and extra set of batteries recommended to have on hand in case of emergency as well as a permanent source of low voltage DC power day or night. 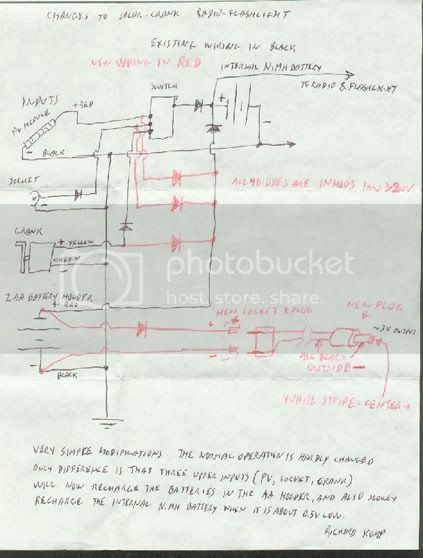 Here is the schematic that Richard Komp of Maine Solar Energy Association and Grupo Fenix drew for me when he modified one of my solar/dynamo flashlight/radios to charge AA batteries.